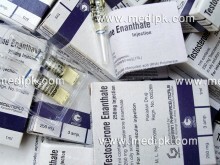 Testosterone Enathate 250mg from Geofman Pharmacokinetics: Testosterone in plasma is 98% bound to a specific testosterone - estradiol binding globulin, and about 2% is free. Inactivation occurs primarily in liver. About 90% is excreted in the urine as glucuronic and sulfuric acid conjugates , and about 6% is excreted in the feces,mostly in the unconjugated form. Indications & Dosing: Males: Peplacement therapy in conditions associated with a deficiency or absence of endogenous testosterone : •Primary hypogonadism (congenital or acquired) : Testicular failure due to cryptorchidism, bilateral torsion, orchitis, vanishing testis syndrome, or orchidectomy. • Hypogonadotropic hypogonadism (congenital or acquired) : Idiopathic gonadotropin or LHRH deficiency , or pituitary-hypothalamic injury. . • Delayed puberty : Females: • Advancing inoperable metastatic (skeletal) mammary cancer in patients who are 1 to 5 years post-menopausal . For IM use only. Individualize dosage. In general, more than 400 mg/month is not required because of the prolonged action of the preparation. • Male hypogonadism, Replacement therapy 50 to 400 mg every 2 to 4 weeks. • Males with delayed puberty: 5 to 200 mg every 2 to 4 weeks for a limited duration. • Palliation of inoperable breast cancer in women: 200 to 400 mg every 2 to 4 weeks. Androgen therapy occasionally appears to accelerate metastatic b Contraindications: Patients with serious cardiac, hepatic, or renal diseases, hypersensitivity to the drug , pregnancy, in men with carcinomas of the breast or prostate. Warnings/Precautions: Hepatic neoplasms have been associated with long-term, high-dose androgen therapy. Androgens should be used with caution in children and adolescents who are still growing because of possible premature epiphysial closure in males and females, precocious sexual development in prepubertal males, or virilization in females. Androgens may cause increated risk of prostatic hypertrophy or may stimulate the growth of occult prostatic carcinoma (esp.in the elderly patients). Pregnancy/Nursing: Pregnancy category FDA C. Reports of female fetal virilisation following maternal use of testosterone or methyltestosterone during pregnancy. Testosterone should be avoided in women who are breast feeding because of the theoretical potential androgenic effect on the infant Drug interactions: Combinations containing any of the following medications , depending on the amount present, may also react with this medication: Anticoagulants, antidiabetic agents,hepatotoxic medications,human growth hormone. Side effects: Gynecomastia,excessive frequency and duration of penile erections, decreased ejaculatory volume, and oligospermia at high doses, hirsutism, male pattern baldness, acne, seborrhea, retention of sidium, potassium, chloride, calcium, and inorganic phosphates , nausea , cholestatic jaundice, alterations in liver function tests, and rarely hepatocellular neoplasm, increased or decreased libido, headache, anxiety, depression, generalized paresthesia, sleep apnea syndrome, increased serum cholesterol, inflammation and pain at the site of IM injections. Use of a wet needle or wet syringe may cause solution to cloud, however potency of medication will not be effected. Patient Informations: Abuse: The adverse effects arising from the illicit use of androgens and anabolic steroids by athletes, often taken together at doses well in excess of those used therapeutically, have been discussed. Effects have included abnormal liver function and hepatic neoplasms, an atherogenic blood lipid profile and increased risk of cardiovascular disease, and reduced glucose tolerance. Hypogonadal states are commonly induced (azoospermia or oligospermia and testicular atrophy in men, and amenorrhoea or oligomenorrhoea in women). Storage: Store between 15 to 30?C. Keep out of the reach of children. 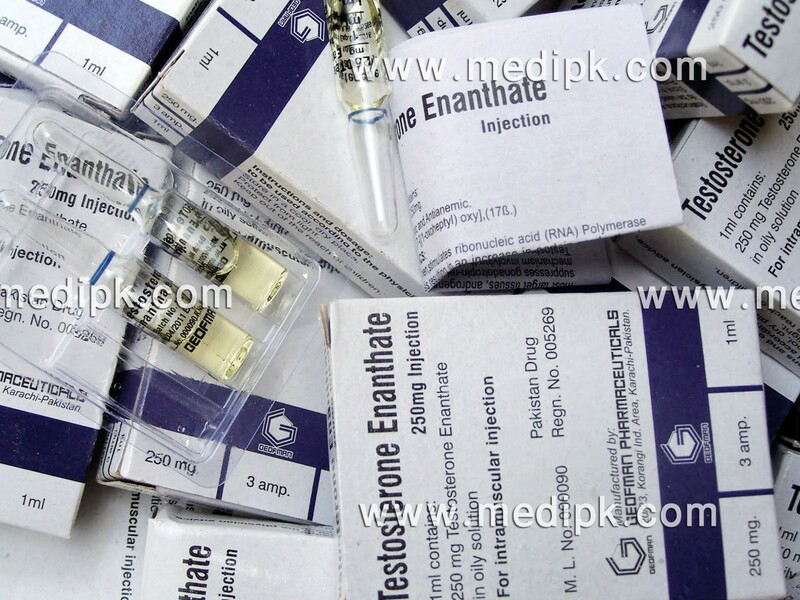 How supplied: 10 Ampoules in a pack, each contains 1ml testosterone enanthate in oil (250 mg/ml) . Click the button below to add the Testosterone Enanthate by Geofman Pharma 250mg / Amp to your wish list.